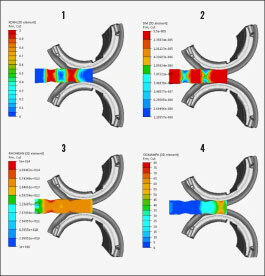 It’s important to understand the microstructure of forged parts in industries such as automotive and aerospace due to recent regulations, and simulation benefits are presented here to consider when working with rolled rings at different structure levels. 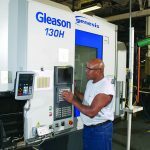 Anticipating the microstructure evolution during the manufacturing process has long been a major concern for specific industries such as aerospace. 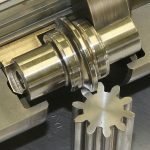 More recently, with the introduction of weight reduction regulations such as Corporate Average Fuel Economy (CAFE), the requirement to understand and control the microstructure of forged parts has permeated a number of other industries, more specifically, automotive. 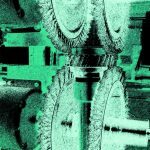 The simulation benefits of forged parts have gained more recognition, and the forging industry now sees the main interest in modeling shifting to the understanding of the microstructure. 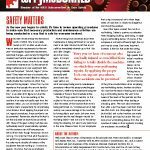 This paper presents the latest developments by Transvalor, a leader in material forming simulation, on this topic. 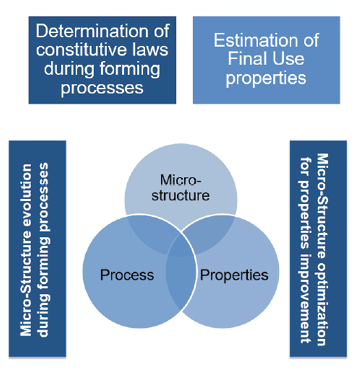 From macro to micro models, a description of the benefits and drawbacks of each model are presented, and a clear perspective of the models that best fit the future of microstructure modeling is provided. 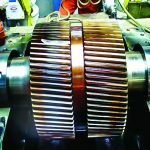 The microstructure is extremely important to understand the final properties of the gears. 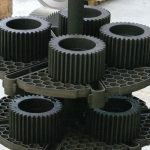 The same gear with the same material forged under different conditions or process will have totally different in-use properties. 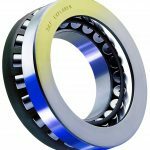 It is for this reason that controlling the microstructure and anticipating its evolution via the simulation is essential to deliver the best gear to the final customer. Figure 1 shows the critical window during which the final microstructure is set for the final product. 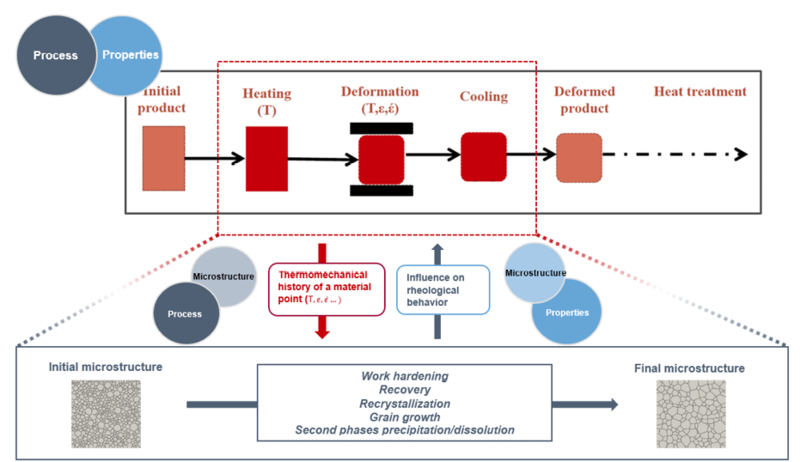 Figure 2 shows the different parameters influencing the transformation of the microstructure during the forming and cooling. Transvalor has developed a new, more accurate approach. The multi-scale approach shown in Figure 3 enables engineers to understand the challenges faced at each scale of the analysis. The key concept is that if the model can “understand” what is happening at the mesoscale level, then the model can more accurately describe the behavior of the material at the macroscale level. 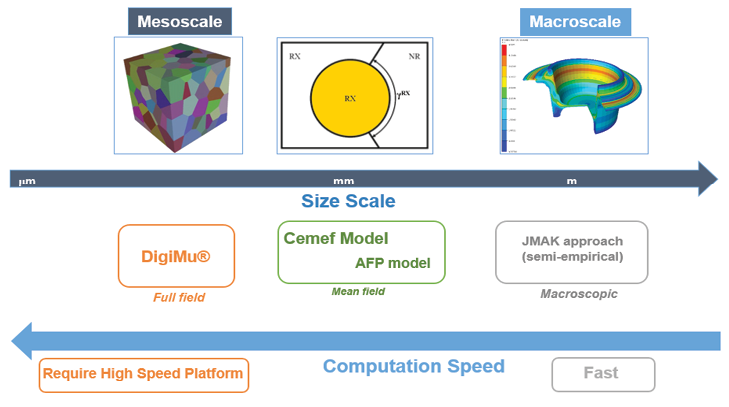 The macroscopic or semi-empirical model known as JMAK (Johnson-Mehl-Avrami-Kolmogorov) is widely used by researchers and in commercial simulation solutions to describe the grain nucleation and growth of a material. This model is a global description of the recrystallized fraction, and it does not account for any physical phenomenon, such as dislocations or grain boundary mobility, and relies on observations. This model accounts for the dynamic, meta-dynamic, and static recrystallization. 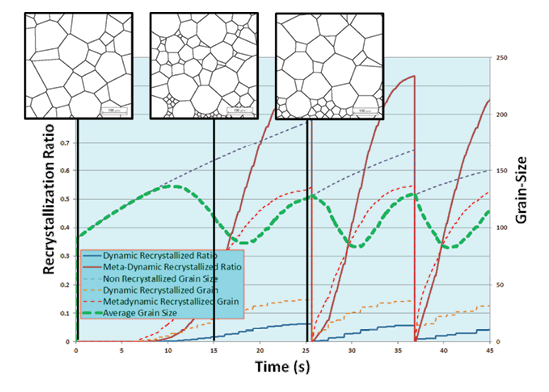 Figure 4 shows how the nucleation and grain growth occur during each type of recrystallization. The process parameters are the main drivers with this model. 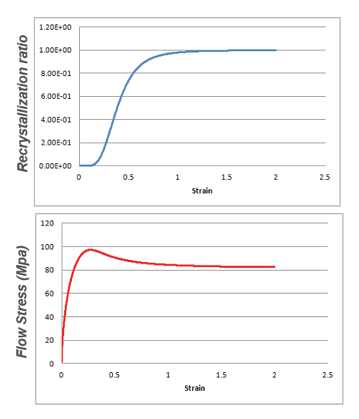 Figure 5 shows the impact of each process parameter to the three types of recrystallization. 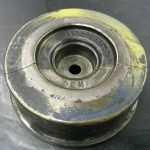 While a rolled ring has been used as an example in this paper, the model can be used for any gear forging process because it is not process related, but material related. 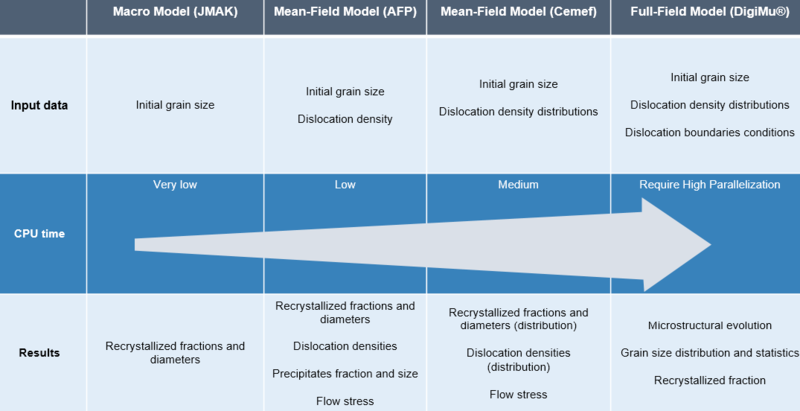 Using the JMAK model (Waspaloy®) implemented into Transvalor’s Forge® simulation software on a ring rolling example, the chart in Figure 6 presents the average grain diameter evolution at three different locations in the ring. The results are gathered by sensors illustrated in red, blue, and green in the illustration. 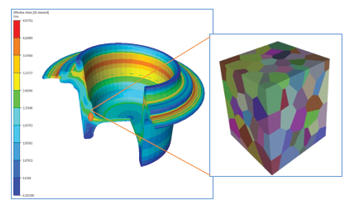 The ring rolling process was chosen for this study because it is one of few processes together with cogging to offer a very small deformation area compared to the surface of the ring, which challenges the model the most. 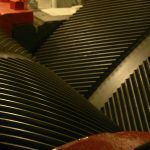 The section between the mandrel and the main roll is deformed radially, while the section between the two conical rolls is deformed axially. 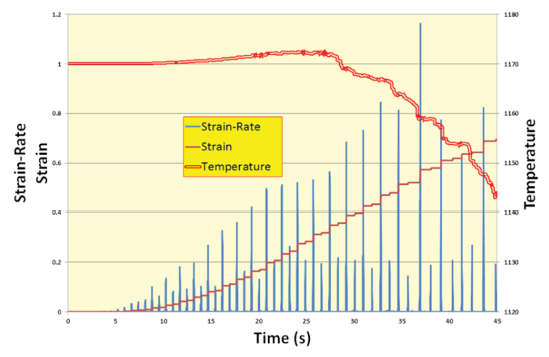 Figure 7 shows the evolution of the process parameters, which consists of peaks of strain rate when the material goes through the mandrel/main roll section, shorter peaks between the conical rolls, reduction of temperature over time, and increase of strain based on the strain rate phenomenon explained earlier. Figure 8 illustrates the global evolution of the microstructure at these locations. A wave-like evolution of the average grain diameter is shown, which is explained by the specific process of ring rolling. In this particular process, the grain size evolution is a balance between deformation and temperature evolution. The comparison between dynamic and meta-dynamic recrystallizations is also illustrated in Figure 8. The macro/semi-empirical model is a good model to describe a specific material, and it is fast to compute. However, it requires many lengthy and costly experiments to determine the model parameters. This process is unrealistic to build a database of several hundred materials. Transvalor has worked intensively to incorporate all the materials described with this model through different projects available from several open databases worldwide. Forge NxT 1.1 (the latest version of Forge) incorporates 21 materials (steels, stainless steels, and nickel-based alloys) in its material database with the definition of the recrystallization following the JMAK model. 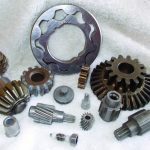 This database addresses most of the materials used in the gear industry already. As opposed to the macro model, the mean-field models account for the elementary physical phenomena such as density of dislocations and grain boundary migrations. In real life, one grain contains an un-homogenized density of dislocations and is not spherical. Transvalor experts have investigated two models: One considers an average density of dislocations and an equivalent spherical grain diameter. This hypothesis is illustrated in Figure 9. The other model adds a distribution of grain sizes instead of an average grain size. With this type of model, the input parameters are no longer experimental values, but are elementary physical properties such as the Burgers vector, shear modulus, grain boundary mobility, diffusion, and interfacial energy. As for the output results, while the macro model provides the grain size, recrystallization ratio, and nucleation rate, the mean-field model adds the evolution of the density of dislocations and the impact on the flow stresses. The impact on the flow stress means that the rheology of the material is coupled to the evolution of the microstructure. The coupling model used in the Forge software is the Taylor model. While it is technically possible to couple the flow stress evolution to a macro model, it is not recommended because the evolution is calibrated based on the specific conditions for the experiments made, which are usually not the ones used during the forging operation. Also, the evolution of the rheology is unknown, so additional guesses must be taken. In addition, the macro model does not account for the density of dislocations, which is the main phenomenon influencing the rheology. 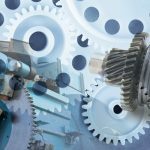 Transvalor has worked with two university partners, RWTH Aachen University and CEMEF (French School of Mines Lab), and both models have been tested using Forge simulation software. Figure 10 shows the impact of the coupling on the rheology in comparison to the evolution of the recrystallization ratio. Figure 11 is an example of reducer rolling (preforming) using the mean-field model approach. To balance between accuracy and computation speed, the mean-field models are the most promising approach today. 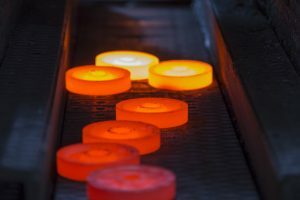 They bring the simulation of forging processes to a level of accuracy never reached before. Taking into consideration the elementary physical phenomena into the global rheology is the best way to bring the modeling of forging processes to another era. 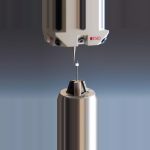 The accurate coupling between microstructure evolution and macro material rheology is no longer challenged within the scientific and industrial communities. 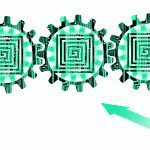 The models must take it into consideration, and material simulation software vendors must integrate such models moving forward. At this scale, it becomes easier to understand and model complex physical phenomena such as crystal plasticity, large deformations, recrystallization, and grain growth. 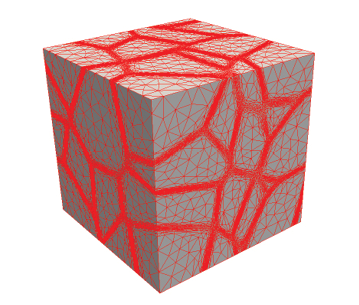 The model works on a poly-crystal, as shown in Figure 13, and by applying the latest adaptive re-meshing techniques introduced in several Transvalor products (Forge, Thercast®, and Rem3D®), as well as level set methods to simulate the movement of the grains’ boundaries in the poly-crystal. It is possible to understand how the poly-crystal reacts under certain constraints (with forging parameters at the specific location). Figure 13 shows the initial mesh of an RVE and the high density of nodes and elements in the grain boundary areas. These boundaries will evolve based upon the mechanical and thermal conditions. The main goal of this model, considering today’s computational available power, is to calibrate and feed the parameters needed to the mean-field models. 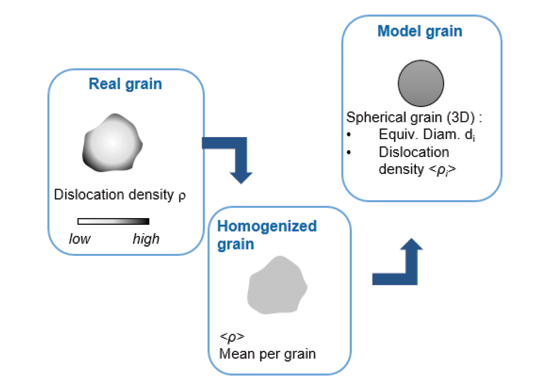 The accuracy (compared to actual grain shape) of the grains’ topology and morphology is a major improvement in the determination of the microstructure evolution. The development of the full-field model presented here is a major step toward the full microstructure simulation. In partnership with CEMEF, Transvalor has developed a new software called DigiMu® based upon this full-field model. A first version was delivered in March 2016. Figure 14 shows an example of results from DigiMu software. 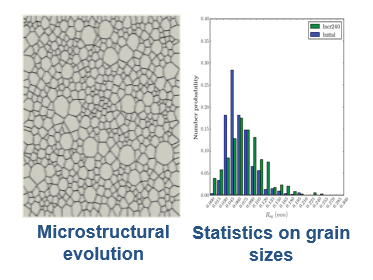 The state of the art in modeling of microstructure has been presented with three main approaches. The macro model has been used for over a decade, and even though it is a good first definition of the microstructure, it has proven its limits in accuracy and in establishing a wide range of material definitions. 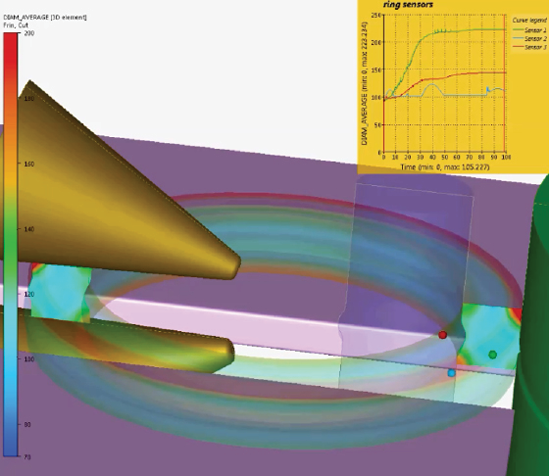 The mean-field models are the most realistic for industrial uses and for broad material definitions. 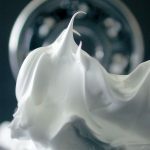 The micro phenomena such as dislocations are the essence of these models, and it is well-established that these phenomena drive the global rheology of the material. 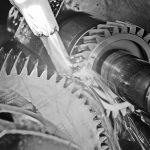 The full-field model has the potential to help engineers in the forging and gear industries determine the parameters to feed the mean-field models. 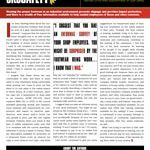 A first version of DigiMu® software that integrates this model has been released by Transvalor. This paper demonstrates that microstructure evolution simulation is now possible and effective. 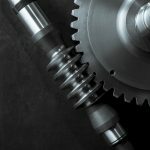 More microstructure models should be developed and existing models should be refined to better serve the needs of the gear industry. 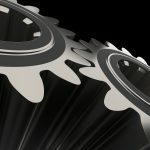 Transvalor makes its range of products available to bring the simulation to anyone in a gear manufacturing company interested in anticipating and solving quality issues. 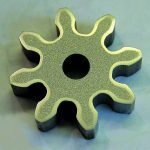 Understanding and controlling microstructure throughout the manufacturing process is critical to ensure the final gear will comply with the quality expectations. Figure 15 shows a summary for three main points (input data, CPU time, and results) of the models described in this paper.